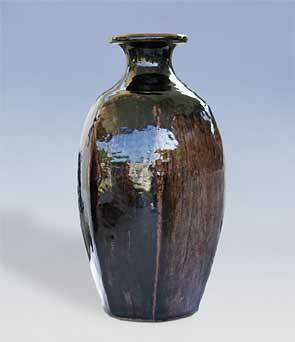 Cut-sided tenmoku Brier vase - 13½" (342 mm) high. Amanda Brier was born in Falmouth in 1978. 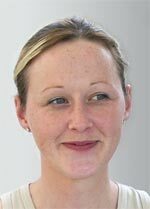 She studied Art and Design from 1994 to 1997 at the Southdowns College, and went on to gain work experience at Poole Pottery. In 1997 she moved to Falmouth and attended the Falmouth College of Art for three years graduating with a degree in Studio Ceramics. Towards the end of her course she was able to get some further work experience at Dartington Pottery. Amanda then went to work at the Leach Pottery for five years during which time she absorbed many of the skills and traditions associated with that pottery. She now has her own studio in Falmouth and likes to work in stoneware and porcelain using tenmoku, copper red and celadon glazes fired in a gas kiln.